I should probably point out that I do not earn money from this blog, and so this endorsement is my actual opinion and does not include a mercenary bias. I got the idea for this salad/side dressing from Cafe Yumm! which has locations in Oregon and Washington, but not elsewhere. It’s a thick, pungent sauce for jazzing up salads & beans & rice & quinoa & suchlike. Cafe Yumm! sells the sauce in large bottles so you can make versions of their ‘bowls’ at home, but since they don’t appear to sell the sauce online at the moment, if you don’t happen to live in either of those states, you’ll have to make your own! This sauce is strongly flavored! The dominant flavors are lemon juice, thyme, nutritional yeast, and probably more lemon juice. The original appears to be almost an emulsion made with oil, which does make it taste gorgeous, but without the oil, this stuff looks like health food, so that’s what I aimed for, to start off with, until my youngest convinced me to try it with oil, and it really is better that way. The sauce is also not smooth, so you may want to only partially blend the chickpeas/garbanzo beans. However, I should point out that this doesn’t seem to have much punch if it’s turned into mayonnaise by blending the oil into the other ingredients, and the texture isn’t right, so I very briefly stir in the oil at the end. I don’t know how long this sauce would last, but I’ve managed to keep a bowl of it in the fridge for a week without anything untoward happening. One last point, make sure your oil is neutral flavored. I made the mistake of using olive oil once, and ended up pouring the whole lot away as it tasted far too strong. Put the almonds in the blender with the water/milk, lemon juice, thyme, nutritional yeast, garlic, and salt, and process until it’s as smooth as you can get it. Add the chickpeas/garbanzo beans, and process until almost smooth. Add the oil and process only long enough to combine (about 5 seconds on lowest setting, if that). Chill before serving to thicken. Sunshine! Spring is showing its face here in the Pacific NorthWest, and it is far too warm to resist the urge to make salad, today. I’ve made variations of this salad over the last year, but I’ve finally come to the conclusion that less is more when it comes to the dressing for this flag-bearer of a salad. Here we have the quintessential SouthWestern ingredients, all dressed in little more than the sharp floral flavors of fresh squeezed lime. If you love avocado the way we do, add an additional one (in cubes) to the salad before using the final one to decorate the top. I’ve not given a quantity for the chili, as different chilis have such a variation in heat, and different people have such a variation in desire for heat. You should add enough chili to just feel the heat, here, but not overpower all the other flavors. I’ve been using 1-3 tsp of minced, fresh/frozen Hatch chilis, which seems to be about right for my family. Mix the corn and black beans together in a large bowl. Stir the minced chili into the beans. Slice the spring onions on the diagonal into 1/2″ pieces, and the bell peppers, and tomatoes into cubes. Mix these into the corn and beans, stir in the chopped cilantro, and dress with the lime juice. Rip the bigger leaves of the cos/romain lettuce into bite-sized pieces and form all the lettuce into a bed in a large (or individual) bowl/s. Pile the bean mixture onto the lettuce bed, decorate with the avocado, and squeeze some additional lime over the top, if desired. Serve as is, or with tortilla chips or in GF tortilla shells. O.K., I know that this is going to sound gruelingly virtuous, but this salad is actually really rather good. The kale has a fairly astonishing nutritional profile, but it can have a rather assertive flavor, too, so I wanted a dressing that would tame it somewhat. I experimented with various dressings (including orange mayonnaise! ), but in the end fell back on my old reliable vinaigrette, and really that’s all that it needed. 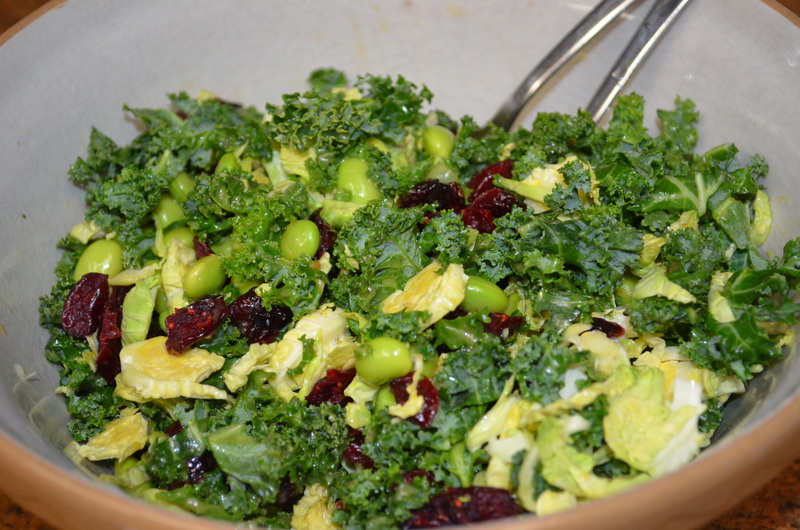 Kale, edamame, cranberry, and brussels sprout salad. Healthy, filling, and loaded with nutrients! A real tonic for the post-holiday season fallout. Although the ingredients don’t look as if they make much salad, this is one of those strangely filling foods that demand time taken to eat. I munch on this and feel as if I’ve (temporarily) joined the ranks of those virtuous salad eaters that you see sitting outside cafes on a sunny lunch time, making one feel like a nutritional neanderthal with no willpower to resist <insert addictive food substance here>. However, I don’t feel unhappily virtuous when I eat it. Sliced brussels sprouts are surprisingly sweet and tasty, raw, and the cranberries give intermittent pockets of intensity against the generally green tasting background of the kale. The salad dressing moistens and brings it all together. For a bit of variation (or if you’re a little wary of kale), substitute finely sliced white cabbage (the stuff used for making coleslaw) for half of the kale. Use a sharp knife to strip the kale greenery off any stalks; discard the stalks, and finely slice the green. Clean the sprouts, and slice. 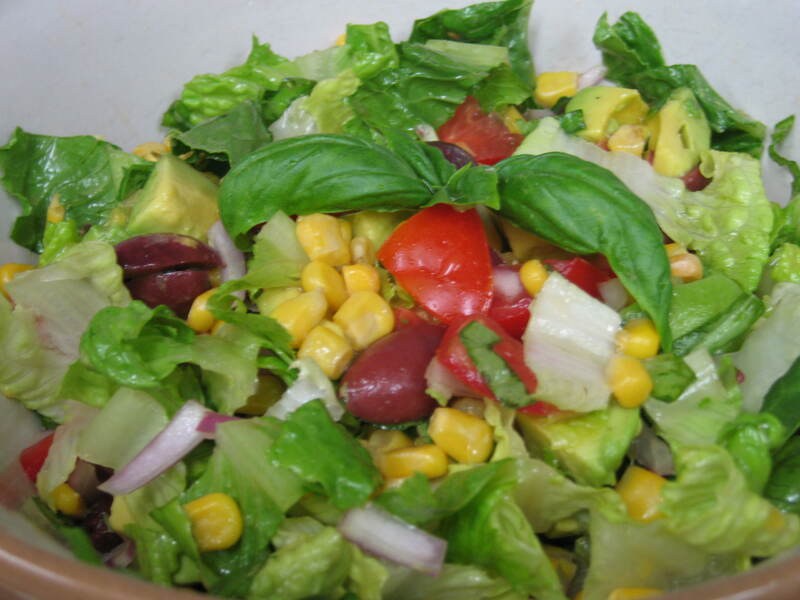 Toss all ingredients together in a large salad bowl, and serve. California is in the clutches of a drought, even by our normal standards. Humidity levels have been down below 20% for ages, and temperatures are hovering around the 80’s (26-32C). 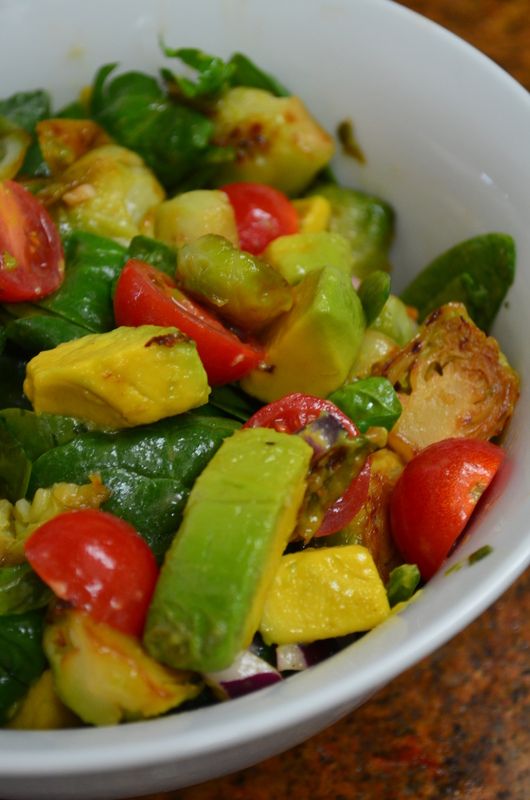 We’ve had less than 1/3 of our normal rainy season precipitation ….. so we’re eating salads. There’s something rather attractive about this leafy salad, speckled with gold and crimson fruit. It’s a good salad for warmer, late winter days, when oranges are fresh off the trees. 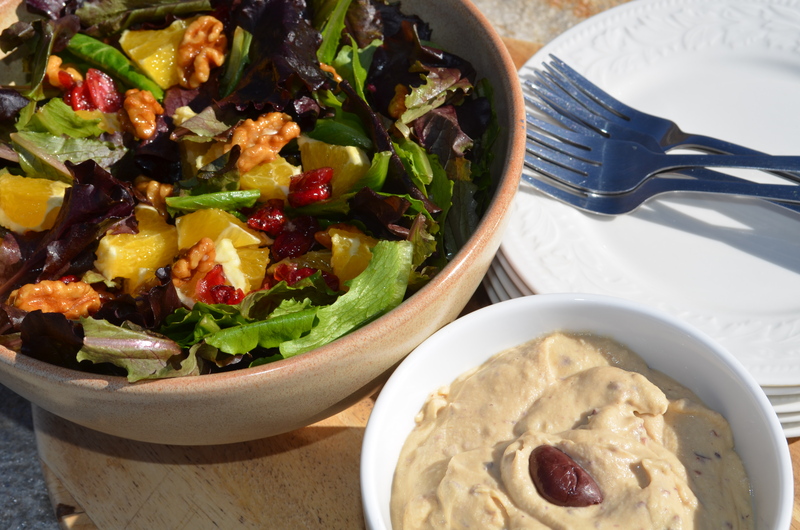 Orange, Cranberry, and Walnut Salad with black olive hummus. Vigorously beat together the garlic, olive oil, vinegar, and maple syrup with a fork to make an emulsion. Wash and dry the lettuce, and put into a large bowl. Peel the oranges, cut the flesh into dice, and mix with the cranberries and walnuts. Add half the fruit/nuts to the lettuce with half of the dressing, and toss with hands or salad servers to combine. Sprinkle the remainder of the fruit/nuts and dressing over the top, and serve immediately. Every year in the spring, Trader Joe’s sells potted basil plants for about the same price as a pack of fresh cut basil. I buy one and stick it in a large plant pot that sits outside our front door, and providing I can dissuade the snails, it produces fresh leaves for about 6 or 7 months. This is a hearty, robust salad which works as a main or a side salad, and just begs for plenty of fresh basil. I particularly like it as a soft taco or sandwich filling. Cut the avocado in half through the stem end and twist to separate. Hold the half with the stone in your left hand, and whack the stone with the middle of the knife blade so you can twist the stone out of the flesh. Cut the flesh into cubes, and use a spoon to scoop the cubes out of the skin. Whisk all dressing ingredients together, then add salad ingredients and toss to coat. Serve within an hour or so such that the avocado doesn’t have a chance to go brown. It has been hot again this week, so I have been serving up salads. Some of our favorite salads feature steamed and seared garlicky vegetables such as French green beans, broccoli, cauliflower, and Brussels sprouts. Yes, I really did say Brussels sprouts in salad. My husband is one of the world’s Brussels sprout haters, unless they’re cooked this way. The basic technique is to put vegetables which have been cut into similar sized pieces, into a pan with a small amount of water, some minced garlic, and some salt. Bring the lot to a simmer, and cook (adjusting the cooking time with the amount of water in the pan or a lid) such that the veggies are cooked by the time the water has all evaporated off. Add some oil or margarine (I use Earth Balance) to the pan, and let the cooked veggies brown on at least one side, stirring occasionally to prevent burning. Watch out for evaporation of the vegetables themselves in this recipe (most notably when family walks past them as they’re cooling). I once had to make something else for dinner when the vegetables all disappeared before they were cool enough to be incorporated into the salad! 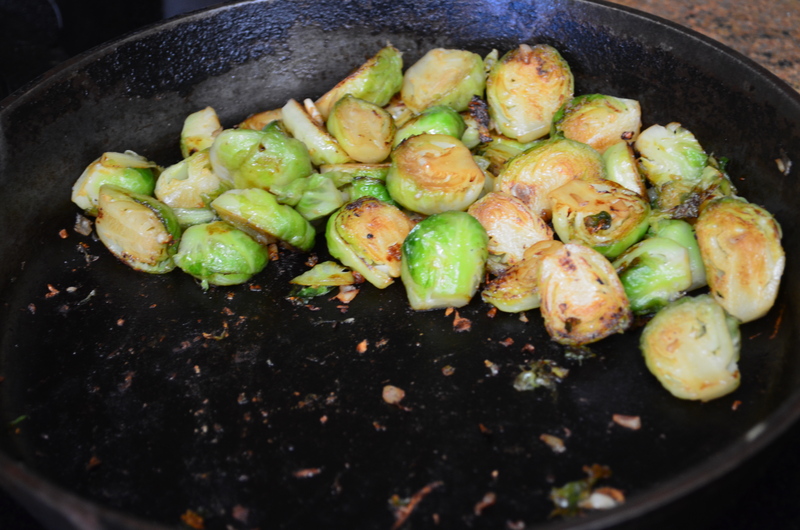 Place the Brussels in 1/4″ water with the garlic and salt, cover and bring to a simmer. Once the sprouts are nearly cooked, remove the lid and allow the remaining water to evaporate off (conversely, if they need to cook longer, add more water), stirring as needed to prevent sticking. Once the water has evaporated, add the oil/margarine, and fry the veggies for about 3-5 minutes until they have browned in places. Do NOT let the garlic burn. 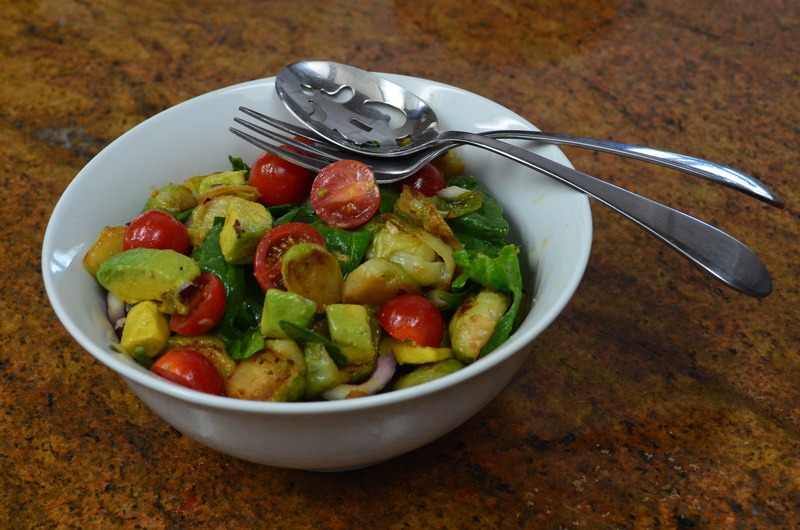 Run a knife around the avocados from stem to bottom, and twist to separate the halves. Remove the pit by holding the avocado in your left hand, and whacking the middle of the knife blade into the pit and twisting it to release. While still in the skin, cut the avocado flesh into 4 or 5 slices top to bottom, and 4 or 5 slices side to side so that when you scoop the flesh out with a spoon, it comes out cuboid(ish). Combine all the ingredients in a large bowl, tossing to coat with the dressing (if using). Serves 2 as a main salad, 4 as a side salad.